Testimonial #1: Officially my fight against breast cancer began in the fall of 1997. The true test of my determination and stamina occurred in the summer of 2002 when my breast cancer spread to my bones and liver. My liver was shutting down and I was jaundiced. I began two types of chemotherapy and my tumor markers started going down and I was no longer jaundiced but I was still very ill. A friend that I had met through business suggested that I go see Faye Schenkman. Having had one of my careers in the pharmaceutical industry, this approach was something that I had not considered. But at this point, I knew that I had nothing to lose and only something good to gain, my life. In January 2003 I began working with Faye. She slowly brought me back from the almost dead. I began receiving Amma treatments, taking Chinese herbs, supplements and immune boosters and made big changes in my diet. I kept getting stronger and stronger and my tumor markers kept going down. I truly had my life back. At Faye’s suggestion I incorporated acupuncture treatments and moxibustion treatments with Kim Rosado into my regimen. Because of my experience I have learned that combining Western medicine with traditional Chinese medicine and nutrition, helps an individual more effectively fight their cancer. Although I have not had the comfort to go into remission, I have been living with stage 4 breast cancer since the summer of 2002. Both Faye and Kim have guided and supported me through this journey. I know in my heart and in my mind I am still alive because of both of them. I am so grateful that I have had these extra years. I still have the determination to fight my cancer and I know they both will continue to help me on many levels: physical, emotional and spiritual. I truly value their knowledge, skill and friendship. Thank you. Testimonial #2: "I became a patient of Wholistic Healing Arts in March 2004 in hope of treating rheumatoid arthritis, an aggressive auto-immune disease, with amma and acupuncture thereby minimizing my medication regimen and alieviating my steroid usage. Little did I know that I would do that and so much more; with your wealth of knowledge and experience in treating the body as a whole, you are helping me to become more pro-active in my healthcare; I am learning the importance and benefits of a proper diet, rest and exercise and how mind and body are inseparable. With ongoing treatments, I am steroid-free for 18 months and am slowly tapering my liver toxic medications; I am again able to work my full time job. My immune system is now greatly improved to the point that if I do contract a cold, for example, I am less ill for much less time. You have also given me a powerful tool in Qi Gung and meditation. Through practice of these disciplines as well as amma and acupuncture, I am today minimally painful with very little joint disfigurement-a far cry from the person who showed up on your doorstep four years ago. I thank you both for your continued teachings, knowledge and experience as well as your boundless self-less caring and compassion. I look forward to my continued personal growth and cherish your guidance and friendship. With love and thanks, Paula"
Testimonial #3: Before seeing Kim and Faye, I suffered from chronic headaches and neck pain. Recognizing that my complaints were manifestations of years of stress and anxiety, they introduced me to a wholistic approach of therapy which incorporated amma massage, acupuncture, herbal supplements and chi gung exercises. I can honestly say that this is the best I have ever felt both mentally and physically. Faye and Kim are not only two highly trained professionals, they are two of the most genuine, sincere, and caring people I have ever known. Testimonial #4: My daughter was born with Sickle Cell Disease which is a debilitating blood disorder that can be fatal. I went to Wholistic Healing Arts with the hopes of helping my 8 year old have a healthier life. I was surprised at the amazing results we have gotten. I used to give my daughter Motrin at least 2 or three times a week for pain. Now with the amma massage and acupuncture therapy, I rarely if ever have to give her pain medication. Her overall energy level has increased tremendously. When ever she gets sick it is much less severe and for shorter periods. Because of her compromised immune system she always caught what ever virus was around, but now kids around her can get ill and my daughter can fight it off without getting sick. Kim and Faye have been so generous to us. I know they don't do this because of money, but because they believe in what they do, and want to help people live healthier lives. I would love to tell more stories of how much Wholistic Healing Arts has helped us, but I am sure you don't have the space. LOL! Joyfully submitted. Greta A, Registered Diagnostic Medical Sonographer & Yarrell A, "Child". When I started coming to see Kim and Faye a little more than 1 year ago, I knew acupuncture was going to be helpful. I just didn’t know how profound the experiences would turn out to be, and the changes I would see in myself and my view of the world. I have suffered from a chronic urinary condition since age 11, and tried many Western therapies. Although some of these helped, they quickly wore off or created new problems. Many didn’t work. I have at times contemplated removing my bladder to try to live a more normal life. But even beyond the physical distress, I felt defective as a human being. I was the “bad patient” who didn’t respond to the typical interventions. Physicians over the years have questioned the truthfulness of my pain, of my psychological health, my motivations—suggesting I would grow out of the condition, or it was due to sexual abuse, or that it didn’t exist at all. I learned not to trust myself or my perceptions, and carried this inner despair over being understood, being isolated. Faye and Kim help me by truly caring—trying to understand me, the symptoms, working with them, listening to my concerns, showing me how to take care of my health. More than anything, they are genuine healers who combine their amazing knowledge and spend ample time and energy on each patient they see. They are helping me understand that the illness that defined my existence for 20+ years is manageable. They are empowering me to become whole again. There is no greater gift! Testimonial #6: Top 3 reasons why I now mainly rely upon the expertise of Kim Rosado & Faye Schenkman to care for my spirit, mind & body over traditional doctors: BETTER service, GREAT after hours availability and AMAZING results! Since under their care I have been able to more fully address & understand serious lung-related health issues through their art(s) of healing the whole. Contributing to this success is the replacement of the traditional roles of patient/practitioner with friend/family. Receiving acupuncture from Kim or an Amma treatment from Faye are now mainstays in the cache of tools that I rely upon to care for my spirit, mind & body. Testimonial #7: I started regular Amma and acupuncture treatments when I was diagnosed with a herniated disc in my lower back. The treatments helped tremendously. I saw a major difference in the way I sat and just in my everyday life. Before I knew it my back was better however I decided to continue with regular acupuncture treatments to help maintain my health. I have also stopped my allergy shots for the past two years and take herbs and get treatments when my allergies get bad. I also find that when I am sick I am able to knock it out of my system quicker through the use of herbs. In general acupuncture and Amma has given my body a better balance and I just feel healthier. Faye and Kim have both showed me that through acupuncture and Amma therapy I could change my life and I have. They are two of the most caring and knowledgeable people I know. They are always willing to help whether it is about getting over a cold or something else going on in my life. I thank both of them for their help and continued guidance. 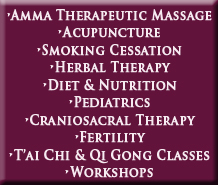 Testimonial #8: Amma treatments are extraordinary and outstanding. There are only positive benefits from taking them. I am a woman going through my changes and have had various health challenges. With Amma and supplements and Faye's complete individual program that works for me, I have a healthier and better quality of life. Faye is a brilliant healthcare practitioner who also is an amazing kind, compassionate caring human being. She will direct and guide you to a path of longevity and well being if you listen to what she tells you to do. This is not an overnight magic pill. You must live the walk she guides you through on your journey. You will see positive results. Trust me, you will not find better. Faye is genuine with the highest level of integrity and standards of excellence. Great work you do - Bravo! Thank you for all your help,caring, time, consideration and efforts. Blessings. Testimonial #9: As a surviving World War II veteran (Atlantic and Pacific theatres), I fortunately became deeply involved with the universe of wholistic medicine over thirty years ago. I currently see Faye and Kim on a weekly basis for acupuncture and Amma treatments. They also monitor my use of nutritional supplements and exercise. Despite numerous hospitalizations for my heart, prostate cancer and knee replacements I still possess the physical and mental energy to not only participate in sports but also to lecture on "holistic medicine" to many veterans' groups in addition to a men's group at my condominium residence. I attribute my continued good physical and mental health to their wonderful healing. Testimonial #10: Dear Kim and Faye, when Alex and I began treatment at Wholistic Healing Arts, I was exhausted and frightened about the future medical, academic, emotional, and social consequences that lay ahead for my daughter as a result of constant sleep deprivation. At four years old, Alex rarely slept more than three consecutive hours due to two different types of sleep apnea. When the recommended surgery to remove her adenoids failed to provide any relief from the choking, gasping, and constant waking through the night, we were told it would be several years before she could safely use and “possibly” benefit from adult treatments available for sleep disorders. We never expected such rapid and dramatic results when we first came to you! Although we were truly amazed when Alex’s sleeping improved after just one treatment, it is only now, after several months of living the cumulative effects of regular treatments, dietary changes, herbal supplements, and of course—sleep, that I can clearly see just how huge of an impact you both have had on our family. I am grateful to you for so many things. Alex is regularly sleeping 10-12 hours without apnea episodes! When she does have an occasional episode, it is much, much less severe. Instead of dreading nighttime with fear and anxiety as I watched my child literally stop breathing many times each night, I am getting desperately needed sleep myself! You have willingly shared so much knowledge and information about foods, herbs, and healthy life choices. I want you to know how much I appreciate you teaching me techniques to use with Alex at home to lengthen time between treatments and empower me as a mother to help my child. Most importantly, thank you both for the skill, warmth, professionalism, respect and dignity you treat us with time and time again! Sincerely. Testimonial #11: Dear Faye, ever since we spoke about your new web site, I have been thinking about writing a testimonial worthy of your skills, talent and compassion. Words rattled around in my head for months but none seemed to express the extent to which you have touched our lives. You were there when my toddler daughter suffered from facial paralysis. Your patience and knowledge of pressure points helped us through. You were there when my teenage son was depressed and suicidal. Your mastery of Chinese herbs and compassion guided us. You were there when my two year old son was diagnosed with Acute Lymphocytic Leukemia. He responded so well to the chemotherapy that his oncologists asked us about the supplemental treatment he was receiving. Ammatherapy, Chinese herbs, wisdom and infinite empathy enabled us all to live through the challenges of childhood cancer, a fate I would wish on no one. Testiminial #12: My daughter Amy is responsible for both my wife and I becoming patients of the "Wholistic Healing Arts Center". For many years Amy has been an advocate of Kim and Faye. My daughters' entire family has been professionally cared for in all aspects for health care and body healing. my rheumatoid arthritis, I was constantly having pulsating feelings in my right arm. I can describe it as having a headache with-in my arm. Kim started me on "amma" therapy. She carefully manipulated the pressure points throughout my body, getting blood flowing to all my joints. On occasion we would switch to "acupuncture". After a few sessions the sensation of my arm started to dissipate. I am totally free today of any "headache" feelings in my arm. I am a weekly patient today, and so is my wife and daughter. Testimonial #13: I started seeing Kim for acupuncture because of acute back pain. After one treatment I began feeling really good. The pain in my back is much more manageable and the first few steps I take when I get out of bed are no longer painful. That’s such a huge improvement from where I was before. I still feel the pain in certain positions, but it’s so different from before. I am so happy and for the first time in 2 years I am hopeful that I won’t have to live with this pain forever. Thanks so much!